 First of all, thank you to everyone who came out to the show! I had a great time, made new friends, found some new resources, and received valuable and encouraging input from everyone that I talked to. And a special thank you and congratulations to Stephen and Kirk, the winners of my raffle! 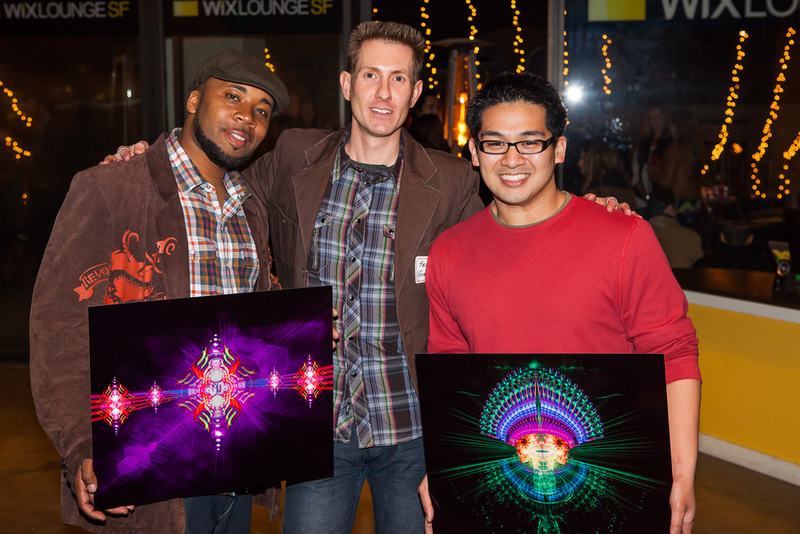 They each won a 16x20" aluminum print from my Light in Dark Places collection. I was humbled by their enthusiasm and appreciate after winning. I heard a rumor that Stephen is hanging his copy of Drones in an all-yellow-painted hallway… which, sounds awesome. To everyone that didn't win, my sincere thanks for the support, and I hope you get one next time! Raffle winners Stephen and Kirk! To be honest, I didn't think the show was even going to happen for me. I spent many sleepless nights finishing two pieces for the show (don't tell anyone, but The Translator and The Negotiator were not complete when I got accepted to the show… but that's our little secret). I worked so hard to get ready – for my first, real show – but I must have had some bad karma because the problems that I had getting things printed were so bad that it was comical! I'm not going to name names, because both of the printing companies did their best to fix the problems, but HOLY S#!T was it stressful. One of my prints arrived with blown-out highlights. Two prints were mounted upside-down. One print was the wrong image altogether. A few were late and the two largets prints were REALLY late (as in, less the 24hrs before the opening), and they arrived without any hanging apparatus. There were a few moments when I thought to myself… this just wasn't mean to be. But, in the end, thank the gods, it all worked out in the end. I was hoping for some positive feedback during the show. I was not expecting to receive positive feedback from everyone, and I certainly wasn't expecting to sell anything. With one sale done, 2 others in the works, and happy raffle winners, I'm absolutely thrilled. The most interesting part of the whole night, for me, was hearing people's interpretations of my work. I heard many people liken my images to Aztec warriors, Predator, those guys from 5th Element, jellyfish, and more. I found it fascinating to hear how different people saw different shapes in each work. It never occurred to me, for example, that my pieces might not even be perceived as the faces of creatures. I look at these pieces SO much, that my vision of each is completely ingrained in me. I LOVE hearing new interpretations. My favorite of the night, is that the two creatures in the Versus image were getting ready to kiss. What?! They're squaring off for battle, I said! But then I thought… you know what, I'm glad that different people see different things in my work. I hope that means I'm doing something right. I want to close this post with a thought that one of my mentors once said, during an Adobe Illustrator class that I was moonlighting in while working at a community college back in Detroit. He told us (I'm paraphrasing and quoting from memory), "If you really want to be good at something, you have to make the necessary sacrifices. It's the difference between being good and great. When your friends are out partying, you may have to stay home, and work, and practice. You can't do both. It's up to you to decide." I took this to heart. Leading up to the show, I made a lot of sacrifices. I simplified my life. Some – no, all – of the sacrifices were hard. I didn't go out much, or engage in other activities, I didn't even exercise very much. I knew that I had to hit the books hard, so to speak. I barely made it, but in the end, it was all worth it.